One of a vast pool of promising youngsters to have been blooded by Unai Emery, Arsenal prospect Julio Pleguezuelo revealed that he was informed of his inclusion in the Gunners’ Carabao Cup fold during an impromptu invite to first-team training. 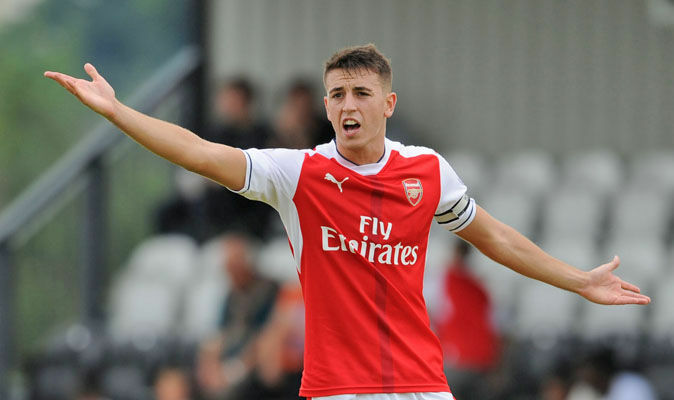 A senior debut for the 21-year-old defender, Pleguezuelo started alongside the experienced Shkodran Mustafi in the heart of Emery’s back four against Blackpool at the Emirates and safeguarded his employers towards a hard-fought 2-1 victory over the dogged League One outfit. “Everything happened so quickly and I’m so happy. “I tried to stay very calm and I knew it was going to be a very important game for me. I tried to take a lot of pressure off before the game and the performance couldn’t have been any better from myself and the team. Joining Arsenal from FC Barcelona’s coveted La Masia youth system in 2013, Pleguezuelo has had to bide his time during his staggered career in England. After two loan spells at RCD Mallorca and Gimnastic de Tarragona, however, the fledgling Spaniard knew that determination and patience would ultimately pay dividends in his quest to claim his first start for his parent club. “I think after six years at the club I had some experience of going out on loan and I knew this was going to be a very important year for me and I kept working and I think I got the reward for that.” He added. Share the post "Arsenal prospect informed of Carabao Cup debut during first-team training"